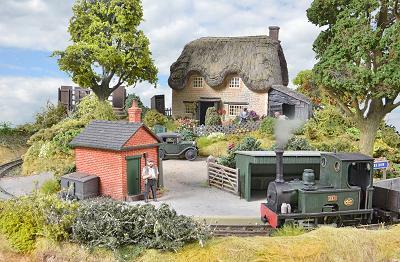 Hobbs Row Halt is a classic English country micro—layout, complete with thatched cottage and "chocolate box" garden. It started out as a simple circular piece of track on an MDF "Wobble Board", obtained from the local charity shop, that I used for running in new locomotives. But after placing a couple of surplus buildings from my Tansey Bank layout inside the loop to check on coach clearances, I realised that a bit of scenery would not go amiss, and Hobbs Row Halt is the end result. The cottage is from the Bachmann Pendon Little Chapel Cottage resin model and the magnificent trees are from the Realistic Modelling Materials range of ready to plant foliage. 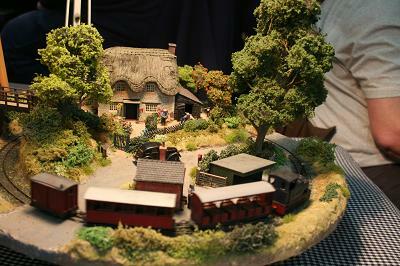 Hobbs Row Halt was featured in the August 2013 edition of Hornby Magazine.